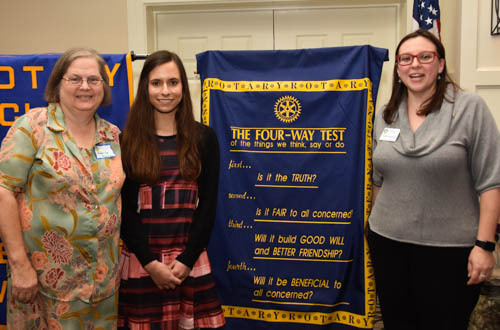 The Rotary Club of Leesburg presented a $100 award to Simona Brkic, a student at Harper Park Middle School who won the Annual Four-Way Test Essay Contest. In the top photo, Simona is in the center. Cherie Krisa, counselor for Harper Park (left), was instrumental in helping Valerie Beaudoin, Rotary liaison (right), conduct the contest. 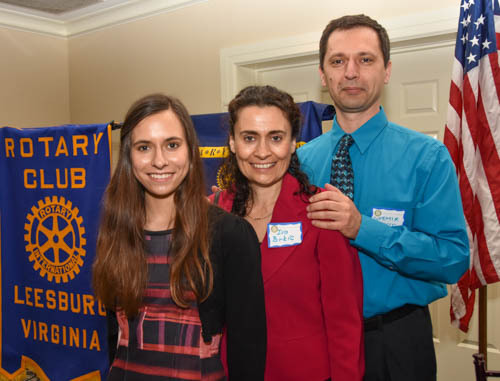 The next photo shows Simona and her parents who attended the meeting and were warmly welcomed by Rotarians. The Four-way test is the cornerstone of Rotary service, beliefs and ethics. It is recited by club members at the end of every meeting and applied to daily activities. "Of all the things we think, say or do...Is it the truth; will be be fair to all concerned; will it build good will and better friendship; and will it be beneficial to all concerned?" The essay was judged based on adequate treatment of all Four-Way Test questions, understanding of these ethical principles, sincerity, originality and essay writing quality. Congratulations Simona. We hope that you check out the Heritage Interact Club next year.